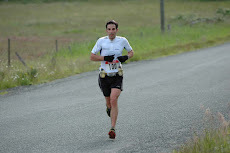 In an attempt catch back up on this blog, I'm combining my last 3 races into one report. 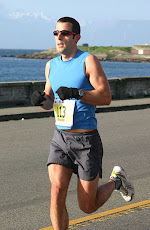 I joined Paul O'Callaghan's Aspire Running group for this fun little event. 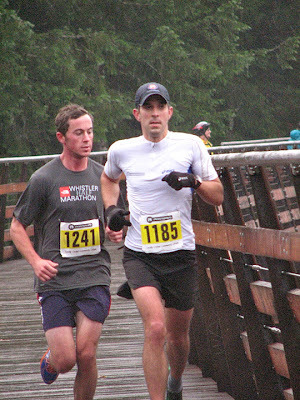 Each person in a 4 person team runs an approx 5k lap around Upper and Lower Thetis Lake. Our team consisted of Paul, Claire Morgan, Brad Cunningham and myself. We were racing in the senior men's category despite having a woman on the team (we would need 2 for a mixed team). I was running anchor so did a warm up lap while Brad led out for a strong first leg in a bit over 17 minutes. Clair and then Paul followed, also running solid legs before it was my turn. Despite knowing better, the race environment caused me to head out a bit hard and I had to ease back a bit after a few hundred meters to avoid cracking. While I was moving OK, both legs and lungs felt a little flat and I struggled to find my groove. When Paul handed off to me, our team was in 6th overall place so besides getting a decent time, my goal was to try and gain a position or at least not lose one. There was no one in sight (except other teams on their 3rd lap) until the last few hundred meters when I spotted Stephen Kilshaw just ahead. Stephen was running all 4 laps solo so I felt a little bad about sprinting him at the line, but it was a race after all. I finished in 16:50 which was OK, but I definitely wasn't on form. We ended up placing 5th overall. Another Aspire team of Sean Chester and Ben Brzezynski took the overall win. When I picked up my number 1 bib for this race I knew the expectations would be high for me to perform well at this race. Then when I saw both Shawn Nelson and Shaun Stephens-Whale I knew it would be a competitive day. Shawn took off the line very hard and Shaun and I stayed with him. After a km or so though, I really felt like the pace was too brisk for me. I knew that I needed to back off a bit or end up cracking or fading badly later in the race. It didn't take much of a slow down to make the difference and put me back into a more comfortable racing zone. Soon after I eased off, another runner came blasting past me. It wasn't anyone I recognized, but from the way he was running, I could instantly tell that he was a not an amateur. Later I found out he was Jasper Blake, former Canadian Ironman Champion - no novice indeed! The 3 of them pulled slightly in front, but never got more than 10 or 15 seconds ahead of me. At the first significant climb of the race, I managed to claw my way back to the group and we were all together after the first puddle. Soon though, Jasper plowed on ahead while Shawn, now feeling his fast start started to fall back. Shaun chased Jasper while I fell in behind. After a few more minutes I passed him, trying to limit the time Jasper was putting into us. I was feeling strong and smooth and was hoping to make it a real race for 1st place. Jasper had a small fall in the 2nd puddle which helped me close a bit of the lead down. We then were onto the single track section of the course. This is my favorite surface and I rapidly closed the gap and when I saw an opportunity to pass I grabbed it. Course designer, Bob Reid, had added a fun new single track section this year which was great. I managed to gain a bit of time on this section and tried to push hard to take advantage of terrain that was favorable to me. I don't know how much I gained, but I could no longer hear Jasper close behind. Once we were back on the main Thetis trails, I knew I simply had to focus on keeping the legs moving well and not getting complacent. As I was nearing the final few hills of the course, however, I heard him catching me fast. Fortunately, I had left a little in the tank and as soon as he came abreast of me at the start of the first small hill, I gunned it. I knew that he must have had to work hard to catch me so my strategy was to push the pace before he had the chance to sit on my shoulder and recover. It seemed to work as he didn't respond as I also hit the final two hills hard and gunned for the finish. I stopped the clock at 34:57, 16 seconds ahead of Jasper for my first ever Gunner Shaw win. It was a good battle and a satisfying win and I was happy to see that I had run the same time as last year despite the course having the extra single track. Shaun came in 3rd and Shawn held on for 4th. Melanie McQuaid won the woman's division over 2nd place Claire Morgan. This was my 3rd attempt at this course. In 2008, I went out too hard and faded badly to finish in a weak 8th place. Last year, the course was shortened to 6.5km due to snow and while I ran fairly well to a 4th place finish, I wanted to be able run a good race on the full course. This time, I was handed a number 2 bib so immediately wondered who had number 1. 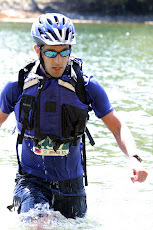 I soon found out on the start line when I saw Jason Loutitt, an impressive runner who recently placed 2nd at the world trail running championships (a 70k ultra race in Ireland). Jasper Blake and Shawn Nelson were also in attendance so it would be another interesting race. Thankfully, the pace at the start of this race was a little more comfortable than Gunner. Jason pushed out ahead and I did not try to match him, thinking that I would either have a chance to catch him on the climbs or he would be gone. Either way, going too hard and blowing up wouldn't help me. The main climb started at about 1.5km and I pushed fairly hard chipping away at Jason's lead. I was able to catch and pass him about 2/3 of the way up. I knew that Jason is a beast on the downhills so figured my only chance was gain some time on the climbs. I had a small lead at the 3km marker, but despite my best efforts to move quickly down hill, Jason was able to pass me back after another km or so. I resolved to do my best and hope that Jason (who sometimes goes out slightly hard and fades a bit) would come back to me. This course is relentless, nearly all of it taking place on the paved trails of the Bear Mountain Golf course. The course is never flat and had numerous corners, getting any sort of rhythm is not really possible. I wasn't feeling quite as good as I had at Gunner, but I was still feeling solid and was able keep the pressure up. At the 5k mark I was 9 sec back and I was able to keep Jason in sight for the entire race, closing the gap on climbs and losing it again on downhills. Jasper was also a factor, just 9 sec back of me at 5k. I never looked back, but knew that I couldn't let myself relax for a second or he would be flying past me. The last few hills are tough with the final one coming just a couple hundred metres from the finish, but I moved through reasonably well. Unfortunately, Jason never faded (or at least no more than I did) and he ended up finishing 29 sec ahead of me. I posted a 35:52 time, over 3 minutes slower than my best 10k time - this course is that hard! Jasper rounded out the top 3 about 30 sec back - Shawn took 4th. Care Nelson set a new woman's course record in 39:29 and Clare Morgan took another 2nd place finish well ahead of 3rd place Melanie McQuaid. For me it wasn't a win, but overall I was quite happy with a 2nd place and was even able to pick up a little prize money in the process. Thanks to Mark Nelson and Nick Walker at Frontrunner Westshore for another well run event. I'm really happy to see that they have the timing down really well now, with results posted before I even get home. 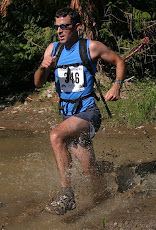 I've been considering doing this race for a number of years, but never managed to get there. This year, particularly since I had not raced an event at the Victoria Marathon weekend, I was finally able to make it happen. Weather predictions leading up to the race called for rain and they seemed to hold true as Sonja and I were treated a steady rain on the drive up. While it wasn't too cold, it seemed inevitable that we would get soaked very quickly. Happily, by the time the race started, the rain at pretty much ceased and conditions were nearly ideal for racing. The hall used as race headquarters was a building on the Shawnigan Lake School grounds. I'd never been there before, but this private school is quite nice with impressive buildings. I didn't know exactly what the my main competition was to be in this race, but I spotted Shawn Nelson shortly after arriving so knew a win would require some work. After a minimal warm-up we were on our way. Myself, Shawn, Hugh Trenchard, and Thomas Marrs soon separated ourselves from the rest of the group. The first part of the course had a couple of downhills which I dutifully noted as we would be coming back up them near the end of the race. We moved along at a decent pace for the first few kilometers and while I had no problems matching the pace, I didn't feel as comfortable as it should have at this point in the race. If things didn't get better it would be a long day for me. I noticed right away, based on his breathing, that Thomas Marrs was working quite hard to stay with us and I could tell immediately that there was no way he would be able to maintain that pace for the balance of the race. It may be fun to run with the leaders, but if it compromises your overall race, it probably isn't a good idea. He is young though and will learn to pace himself better I am sure. Around 4km Thomas fell back a bit while Hugh continued with Shawn and myself for another kilometer or so until the course moved onto the Trans-Canada Trail and headed north. It was around this time that I actually started to feel better and was able to get into a comfortable rhythm where I was working hard, but staying controlled. We ran for about 6km on the trail with a slight uphill grade. While the gravel surface and gradual climb certainly slowed me a bit, I didn't find it bad at all and may have been preferable to the rolling roads in the area. While I set the pace, Shawn held a tenacious grip onto my heels and would not be shaken. I considered trying to put a surge in to drop him, but with half the race still to go decided to just continue to dictate the pace and wait for a later opportunity (assuming I wasn't just hanging on myself by that point). Around the halfway point, we detoured onto the road and were treated to a significant, but thankfully short climb and decent. Soon though we were back on the trail and making our way towards the Trestle. The Kinsol Trestle was recently rebuilt and opened to the public so it was a treat to be able to run access it (the first time for me). Unfortunately, there wasn't time to take a good look since the race was on. We continued past the trestle for 1.5km before turning back and heading for home. The trail north of the trestle was not as well groomed as the other sections we had run, but it wasn't a big factor. It was nice to see many other racers as we passed them heading out to the turn around and I lent encouragement to many and received some in return. Hugh was still running in 3rd, but was a couple minutes back from us so it was definitely a two man race for the win. I was quite pleased that I was still feeling quite smooth and knew I could put in a surge if required. Soon after passing back over the trestle, we moved back onto the road 3km. Shortly after moving onto the road on a downhill section I noticed that I have pulled slightly ahead of Shawn. I was still feeling strong and saw this as my chance to build up a gap. I pushed ahead strongly on a flat section building spread of at least 20 seconds. I felt that as long as I could hold it together on the final hills, I would be fine. The hills were challenging, but I moved as smoothly as possible, finally rounding the corner to the finish and making a decent sprint. My finishing time of 1:15:20 was faster than the 1:16-1:17 time I was predicting for myself so I was quite pleased, particularly since it wasn't a fast course. Shawn came in 40s later for a solid 2nd place, with Hugh rounding on the top 3. Care Nelson pulled away from Claire Morgan on the 2nd half to win the woman's race while Sonja ran very well to a small PB and 3rd overall. I ended up enjoying the course more than expected and while it wasn't a fast flat course, it wasn't brutal by any means.